Ensuring market access, including getting Canadian canola into China, and promoting trade, are top priorities for Canada’s new agriculture minister, Marie-Claude Bibeau. “I already understand we have ongoing market access issues that I have to get into really quickly… ” Bibeau, sworn in March 1, told reporters after her first public address as agriculture minister at the inaugural Canada Crops Convention (CCC) here March 7. “And following up on all the free trade agreements that we have signed in the recent months. We also have the food policy that is progressing. Bibeau, who served as minister of international development since being elected MP for Compton-Stanstead in Quebec’s Eastern Townships in 2015, was part of the cabinet shuffle triggered after Jody Wilson-Raybould resigned as veterans affairs minister. Prime Minister Justin Trudeau filled that position with former agriculture minister Lawrence MacAulay. Restoring Richardson International’s canola exports to China is a pressing issue, Bibeau told the conference — a joint meeting of the Canola Council of Canada and Canada Grains Council. Bibeau told the CCC she’s aware of the issues facing farmers and the importance of agriculture to the economy. “But I know I have a lot to learn,” she added. To that end the next day Bibeau announced a tour starting March 11 to meet with farmers, processors and industry leaders. The tour begins in Vernon, B.C. and ends March 13 in Winnipeg, with stops in Kelowna, B.C. and Calgary, Alta. Bibeau later told reporters she learned in her previous ministry policy needs to come from the bottom up and to stay close to the “real people” doing the work. Bibeau said she will work hard to remove barriers for Canadian durum wheat and pulses entering Italy and India, respectively. “My message to you today is that our government is dedicated to supporting a strong and competitive grain and oilseeds industry in Canada,” Bibeau said. Canada’s goal for exporting $75 billion of agricultural products by 2025 depends on trade, she said. The Comprehensive Economic Trade Agreement signed with the European Union and Comprehensive and Progressive Agreement for Trans-Pacific Partnership (CPTPP) will open up $3.5 billion in exports, including $780 million in canola alone, she added. 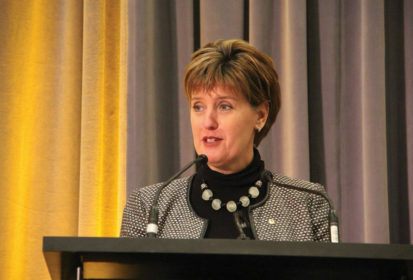 As minister of international development, Bibeau worked with the Canada Foodgrains Bank, an institution many Canadian farmers support. Bibeau, who was born and raised in Sherbrooke, Que., and has a degree in economics and a graduate diploma in environmental management, started her career with the Canadian International Development Agency. Later she returned home to run a tourism business. While in her previous portfolio Bibeau launched Canada’s new Feminist International Assistance Policy aimed at making Canada a leader in the fight against poverty by prioritizing gender equality in the country’s international assistance programming. Coincidently, Bibeau is Canada’s first female agriculture minister, which she told reporters was surprising given the role women play in family farms.